Several years ago a couple of friends had me over for dinner and introduced me to a way to bake halibut that is very tasty. Over the years, I made a few changes to the recipe to my own taste. Just recently, I made this recipe for my family in Oakland, CA. This is not a traditional recipe where you measure a teaspoon of this and a cup of that and cook only for a set time. For this recipe all you need is the basic, conceptual idea of the ingredient amounts that will be needed depending on the amount of halibut you have at hand. For starters you will need three small bowls, a baking sheet (no need to grease), and halibut that has been cut into approximately 1 to ½ inch squares (or whatever shapes and sizes you prefer). In the first bowl, grate a mound of parmesan cheese. I find that a good quality and freshly grated parmesan cheese tastes better than the pre-grated variety you will find on your grocer’s shelf. In the next bowl, chop or press a couple cloves of garlic and pour in extra virgin olive oil to cover. What you want to do is impart a very garlicky flavor to the olive oil. Pour bread crumbs into the third bowl. I prefer the Italian bread crumbs to plain. After you have your bowls set up, take each piece of halibut, dip in the olive oil mixture to coat, then dip in the bowl of grated parmesan cheese to coat, and lastly roll your piece of halibut in the bread crumbs before placing on a baking sheet. After you have all of your halibut pieces prepared, grate some fresh pepper on top and put the pieces in a preheated oven and bake for about 10-20 minutes at about 450 oF. Duration will depend on the size of the halibut pieces. 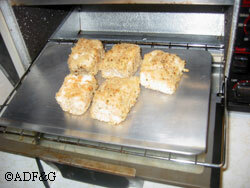 When the coating starts to brown a little, take a fork and split a halibut square open. The piece should be cooked through, bright white with that typical halibut firmness and flakiness. Be careful not to overcook. I like to serve my halibut pieces with tartar sauce and lemon, but they will be tasty as is just fresh out of the oven. I have also used this recipe on other fish too, including salmon, swordfish, and sheefish. ENJOY! !